Chief Minister Virbhadra Singh today on the occasion of International Women Day launched Women Rapid Police Force from historic Ridge, Shimla by flagging off women police riders. Chief Minister said that Women Rapid Force had been set up in Shimla in first phase and later it would be extended to all districts of the State. He said that this Force would play an important role in protecting the women against crime besides maintaining law and order more effectively. Virbhadra Singh said that State Police had started free SMS service on 94591-00100 number to facilitate the general public and anybody could ask for immediate police assistance by sending a SMS on this number. 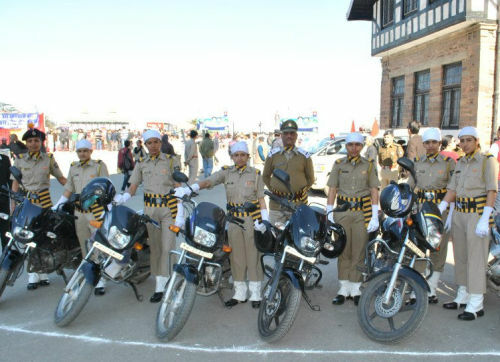 He said that women police riders would reach the spot in shortest minimum time and would take appropriate action. He said that the Women Rapid Force would also work on the complaints received through the police helpline, SMS service besides keeping vigil on crimes related to women. Irrigation and Public Health Minister, Vidya Stokes, Urban and Town & Country Development Minister Sudhir Sharma, Chairman, HP Cooperative Bank, Harsh Mahajan, Mayor, Sanjay Chauhan, DGP, B. Kamal Kumar, DC, Dinesh Malhotra and other senior officers of the State Government was present on the occasion.